It’s Magic is a charity that exists to uplift and entertain using the power of music to strengthen the existing community values. Musical concerts are used as a platform for residents, businesses and charities and It’s Magic engages dedicated volunteers and local business support to provide good value good quality music for all. 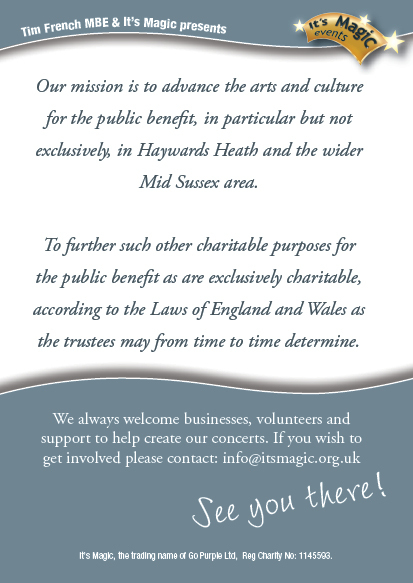 It’s Magic forges strong links with The Sussex Symphony Orchestra, Mark Andrew James, Voices Live, Burgess Hill Choral Society & Sussex Chorus presenting classical concerts – Proms in the Park and Music day on Broadway in Mid Summer and Christmas Classics in winter. International vocalists and musicians have included Katherine Jenkins, Blake, The Commitments, The That’ll be the Day Show to name a few with more planned for the future. It’s Magic nurtures new friendships with local bands and helps promote their growth and success. Showcases include new, Popular, Soul, Jazz, Latino and tribute acts and a fantastic array of semi professional and new talent giving some artists their first opportunity of appearing at large venues before an appreciative audience. 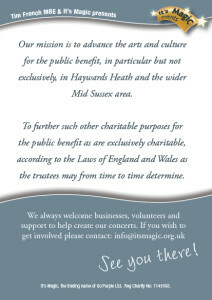 It’s Magic encourages businesses, media and volunteer support to help create and promote these concerts for the benefit of the community, providing optimum value whilst retaining good quality music, with any surplus funds raised donated to local causes and charities. Those who have benefited in the last 12 years include CAB, NSPCC, Headway Hurstwood Park, Shelter, St Andrew’s Community Centre and The Ashenground Community Centre, The Triangle Healing Centre and currently It’s Magic helps to promote the Princess Royal Hospital Campaign and other small charity events.